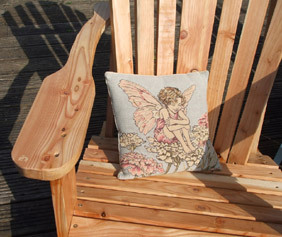 | Home | Brynaber Cottage | Buy Locally Made Garden Furniture ..
We have a variety of hand made Garden Furniture For Sale - made by Toby from local Douglas Fir. 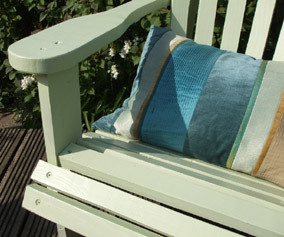 Currently he is making some lovely Adirondack American Style Chairs in different finishes using either varnish or a selection of colours from Farrow & Ball external eggshell paint collection. 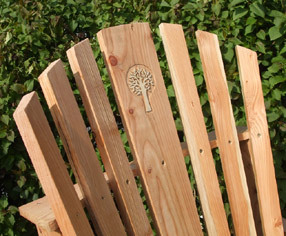 We are also experimenting with a wider back shape to the chair and adding different shape inlays such as hearts, the tree of life and flowers etc. We have some really cute window boxes in different sizes coming soon & little chairs and foot stools. These chairs are incredibly comfortable and will last for more than 10 years outside when treated with external wood paint / varnish. Each chairs comes completely assembled and in the finish of your choice. We can arrange delivery which is currently £23.00 by Courier / Freight. You also have the option to collect or arrange your own delivery. Please give us a call or e-mail to say what chair finish you would like so that we can make sure it is in stock and give you a delivery date which is usually within 5 working days. There are cheaper versions on the market which are factory made abroad, flat packed and made from flimsy wood.